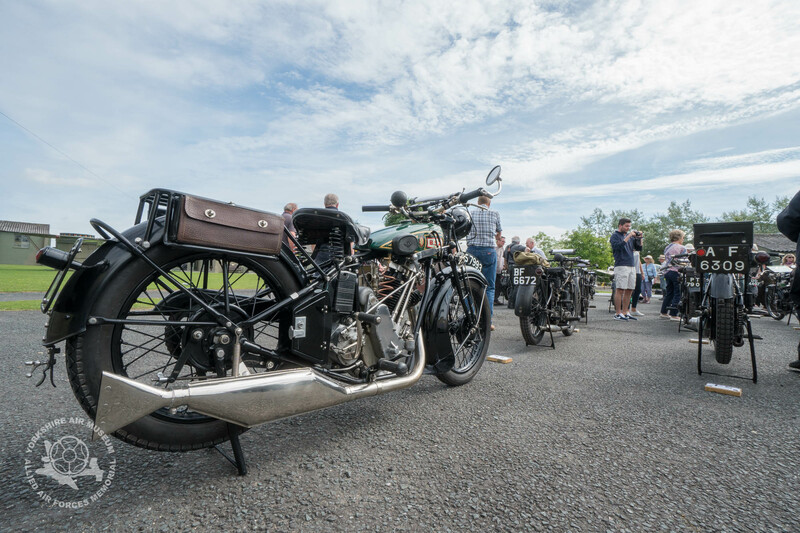 The eighth annual Golden Era motorcycle run was hosted at the Museum on Sunday 24th July. Orginaised with great efficiency, as ever, by the North East section of the Vintage Motorcycle Club, Sunday morning saw more than fifty motorcycles warming up to head out from the Museum across the Yorkshire Wolds for their annual opportunity to enjoy these early machines. Many classic motorcycle enthusiasts consider machines manufactured up until the end of the 1920’s to be the Golden Era of motorcycling, the event therefore takes it’s name from that ethos and welcomes riders of machines manufactured before 1931. With some machines now more than 100 years old, many of the earliest machines were driven by direct drive. This means that, with no clutch or gearbox the only way to stop was to stop the engine. Riding these machines in modern traffic requires a unique combination of skill and courage. By the 1920’s clutches and gearboxes had become standard thankfully but even so, nothing is automatic and it was fascinating to see the details of the many adjustments that need to be made simply to keep these engines running sweetly as they are ridden. While some machines were beautifully restored to immaculate condition, other such as the Douglas and a Norton Speedster were completely original and were running exactly as they were built, complete with authentic scars and wear of many decades of riding. The riders departed at around 10:30 am leaving a lovely aroma of Castrol R oil in the air, before gradually returning for lunch in the NAAFI, their machines on display outside as a few Sunday rain showers thankfully largely passed us by. If you missed out on this great event, we hope these pictures will inspire you to keep a watch on our events calendar for more classic and vintage cars and motorcycles were are working to bring to the Museum in future. Never to young to start….. Awesome motorcycles on display here, a few of these look familiar, I am sure we filmed some of these very bikes from last years annual Yorkshire Steam Rally Video we filmed at Ackworth.